Silversea Cruises is famous for its all-inclusive luxurious cruises, and now the cruise line has two companion golf programs worthy of its name. For those of you who love to golf and love to cruise, these cruises are the ultimate getaway. This all-inclusive golf program will give you the same level of attention on the course as Silversea gives you on board. Several cruise itineraries around the world provide the golf-enthusiast with the opportunity to play at some world-class golf courses and experience the luxury of the Silversea ships at the same time. And you only have to unpack once! Each cruise offers 4 or more courses to choose from. If you want to immerse yourself in golf and then spend your spare time indulging in other Silversea pleasures, the 365-Day cruise program might be for you. This program is offered on every cruise on the Silver Shadow and Silver Whisper, and features daily onboard personal lessons from a PGA-golf pro utilizing the latest V1 video-computer teaching technology. (All of you techno-geeks will LOVE this!) Since Silversea prides itself in taking care of your every whim, all you have to do is worry about improving your swing. When the ship stops at a port of call, you will have the opportunity to go ashore with the pro to play on some celebrated courses you may have only dreamed of before. Escorted golf excursions ashore with the Silversea PGA golf pro. Many married couples love to cruise, but often have diverse interests once onboard. Programs such as these might save your marriage. During the day the husband can golf while the wife shops and goes sightseeing (or visits the spa). Then at night you can dine together and compare your day. Doesn't it sound delightful? 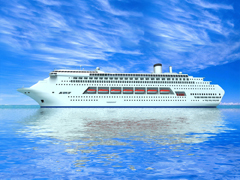 Click here for specific services and departure dates from SilverSeas.